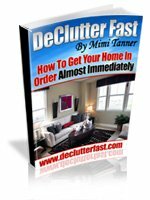 Clutter Free Home - Home Organize It! A clutter free home allows you to spend less time taking care of and looking for "things" and gives you more time to do what you love! When you first move into your home it seems like you have so much space. But as the years go by, more stuff seems to be coming in than going out. One day you might wake up and feel like I have... Overwhelmed. What are you going to do with all the stuff you have accumulated? And how are you ever going to find the time to go through it all? If you are feeling this way then it might indeed be time to weed out the unnecessary items, get organized and create a clutter free home. Home organization is a step-by-step process. It will most likely take more than a few days or a week (even working at it around the clock) to get everything to a manageable level. It's definitely worth the undertaking because once you do, staying organized is a much easier task. If you have a family, you will need to enlist their help. They can pitch in and learn a thing or two about conquering and controlling the clutter in their life. You'll be teaching them lifelong skills in the process too. And hopefully when they get older they will know how to create their own clutter free home! 1) First, start with a "put away" session in the high traffic areas. Concentrate on getting everything that does not belong in this room put into the right room. Then when you can, move on to another room. Room by room you are creating a clutter free home. Over the past ten years, the style of storage containers has changed dramatically. Just visit the container section in your local Target store and you'll see what I mean. Now I'm not suggesting that your run out and buy a whole bunch of containers. Not yet anyway. But as you are decluttering and getting organized, try thinking about what type of containers you could add to each room that would be functional as well as blend in with your décor. Baskets, decorative boxes, etc. can be pretty and store things all at the same time. So instead of storing everything in boxes in the garage or attic, perhaps you can purchase ones that match the décor in each room and integrate them so that no one will even notice they are being used for storage. Think how clever you'll feel! 3) Divide items into categories. Give Away - clothes, small appliances, furniture, etc. that are still in great condition can be donated. Be sure to make that call to your favorite charity and schedule a drop off time Someplace Else - anything that belongs in another room can be labeled for relocation when you get to that room. 4) Remove everything from drawers and cabinets - even entire rooms. I won't kid you, the "move-out-move-back-in" approach to organizing is time consuming. BUT - it's also the most effective way to organize for that clutter free home. It is not only easier to start with an empty space and fill it (instead of pushing things around) but you'll tend to want to put less things back in an empty room once you feel that sense of peace a decluttered space can bring. 5) Make use of all of your available space. In the kitchen, for example, appliances or extra containers can be stored on the uppermost shelves and in the back of deep cabinets. Better yet, ask yourself if they really are "extra" or if you should really part with them. Add decorative baskets to top of the refrigerator for cereal boxes and breakfast food oatmeal, grits and granola bars. In the bedroom, shoes and winter clothes can go into flat storage bins that slide easily under the bed or the dresser. Thinking outside the box will help you make use of otherwise wasted but valuable space. 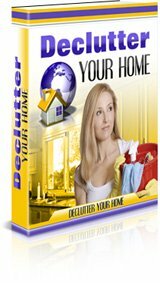 Return From Clutter Free Home To Home Organize It!